Sierra is a maker, a dog & cat mom, wife, and has a passion for creating beautiful things from yarn. She loves to share her creations by writing patterns and creating step by step video tutorials. When she is not working hard on her latest design, you can find her playing ball with her dogs, or snuggled up with her cats (and husband!) watching a movie. I am Sierra, the crafty lady behind Sierra’s Crochet Crafts on Instagram I learned how to crochet from my husband’s grandmother Joan about 4 years ago and instantly fell in love. I can now crochet and knit, and I honestly can’t pick a favorite. Crafting and being a maker has helped me in so many ways, I am shocked that it took me this long to find these amazing crafts. I suffer from anxiety, and creating beautiful things with yarn and a hook (or needles) is very calming and has helped me during many anxiety filled days. Creating patterns has become my main focus this past year. 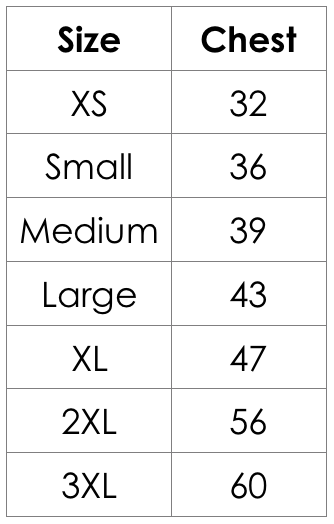 I took the plunge into designing after looking for plus size crochet garment patterns, and not coming up with many options, I decided to start making my own garments for all sizes extra small to 3XL. I also make other items aside from garments, but I think designing clothes is still my favorite! Which brings us to this creation, The Best friend Cardi. I created this piece with my best friend in mind, my mama. (fun fact: she’s also a knitter!!) This is an open vest/cardigan perfect for lairing your spring outfits, or for a bathing suit over up. I decided to make children- adult sizes for this Cardi to be enjoyed by all ages! Notes: All Ch 4 throughout pattern WILL count as a TRC. 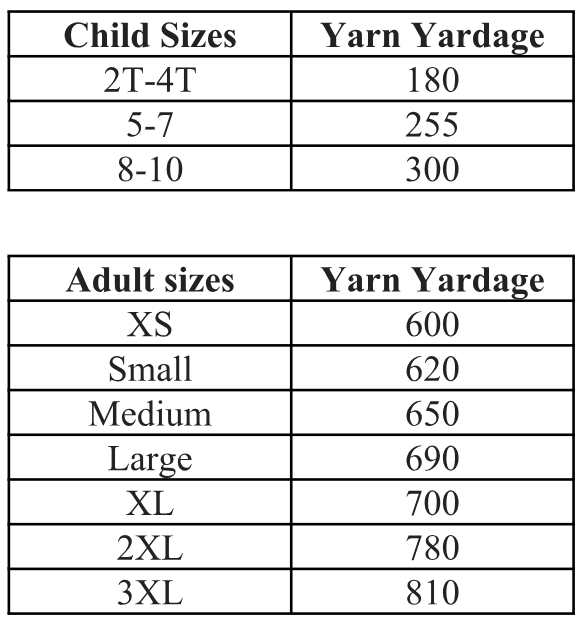 There are two size groups, one for Adult sizes and one for children sizes. Sizes XS-S Tie off leaving a long tail, Attach yarn to the other side of the vest and repeat Row 20- 29 to create second arm opening. Sizes M-3XL Tie off leaving a long tail. Attach yarn to the other side of the vest and repeat Row 20- 31 to create second arm opening. 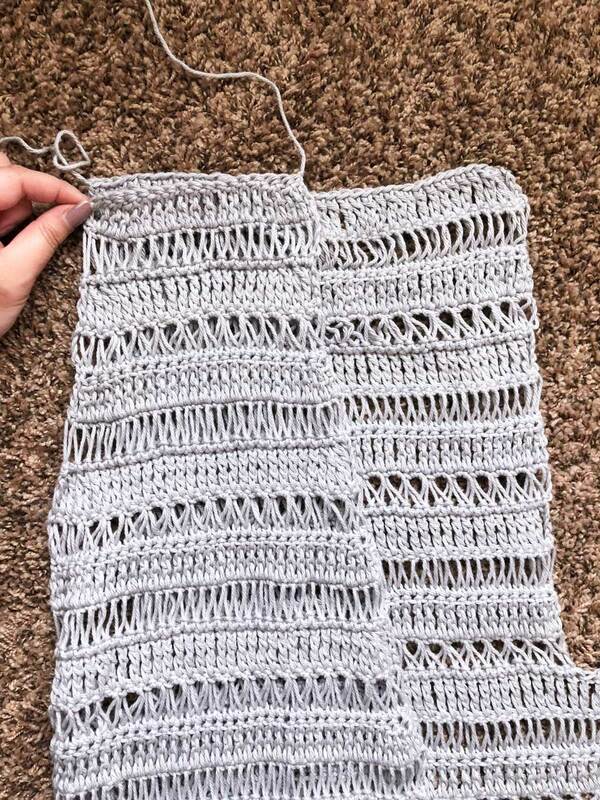 XS-L Sizes: Repeat Row 1-4 until you have reached 10 Rows . (You should be ending in a TRC Row) Tie off leaving a long tail and go to the ASSEMBLY portion. Your vest laid flat should look like the photo above. Take the long tail from the end of your front panel and your yarn needle and line up the top of your front panel/s with the edge of your back panel and whip stitch them together to create your shoulder seams. 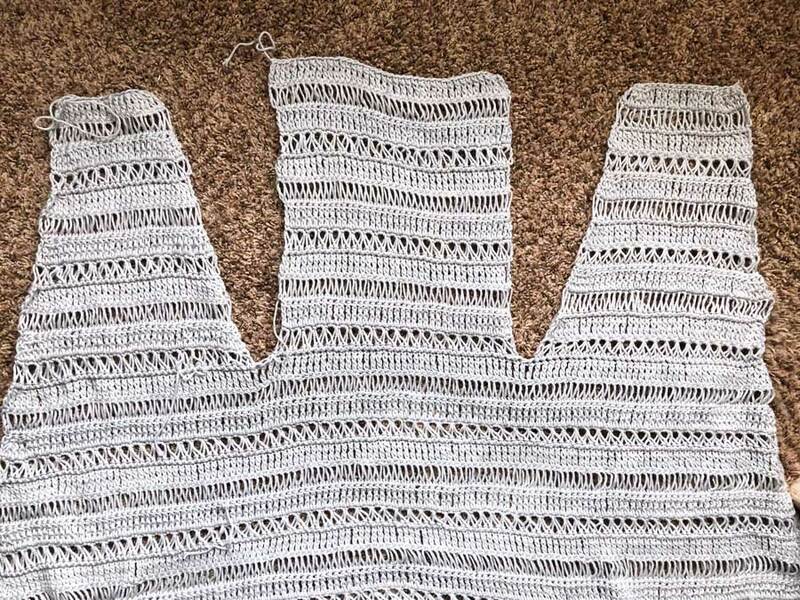 Now that your vest is sewn together, you can now create a single crochet border along the arm hole openings and along the edges of the open front panels and neck area to get a more finished look. This step is totally optional! Attach yarn in the open skipped stitch at the bottom of your arm opening. Ch 1, Sc in same st. Sc evenly around. (To create even sc around, I placed 3 sc in each TRC and BRSS/BRSD stitch) Slip Stitch to the beginning Sc. Tie off and repeat for other arm opening. Starting at the bottom edge of your front panel, attach yarn. Ch 1, Sc in same stitch. Sc upward as evenly as possible. (To create even sc, I placed 3 sc in each TRC and BRSS/BRSD stitch and 1 sc at the beginning of each new row.) Once you reach the neck (the back panel) you will place a sc in each st. Then continue to sc downward toward the other corner edge of the second front panel. Once you are done be sure to go back and weave in any and all loose ends you may have. Then you are DONE! Hooray!!! Sizing will be grouped together. 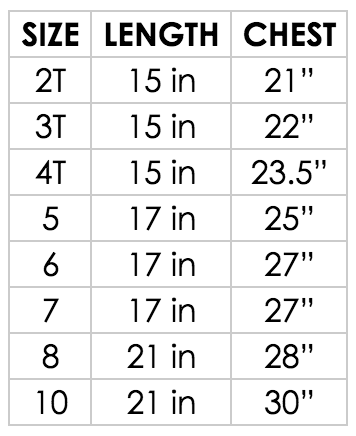 Sizes 2T-4T will be the first number. Sizes 5-7 will be the second number, and sizes 8 and 10 will be the last number. 2T-4T sizes: Tie off leaving long tail, Repeat Rows 8-15 on the other side, to create the second arm opening. 5-7 sizes: Tie off leaving long tail, Repeat Rows 10-17 on the other side, to create the second arm opening. 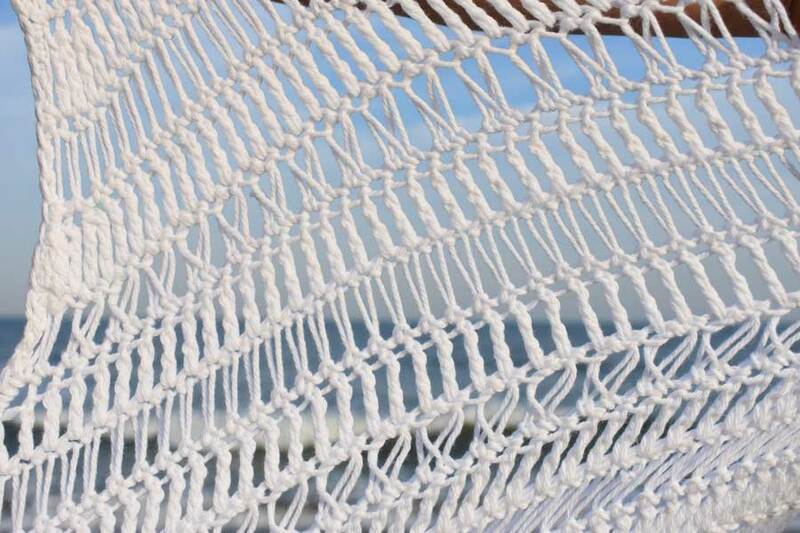 8-10 sizes: Tie off leaving long tail, Repeat Rows 12-21 on the other side, to create the second arm opening. Repeat Row 1-4 until you have reached Row 8. (You should be ending in a TRC Row) Tie off and go to the ASSEMBLY portion above! Repeat Row 1-4 until you have reached Row 8. (You should be ending in a TRC Row) Tie off and go to the ASSEMBLY portion above. Repeat Row 1-4 until you have reached Row 10. (You should be ending in a TRC Row) Tie off and go to the ASSEMBLY portion above. 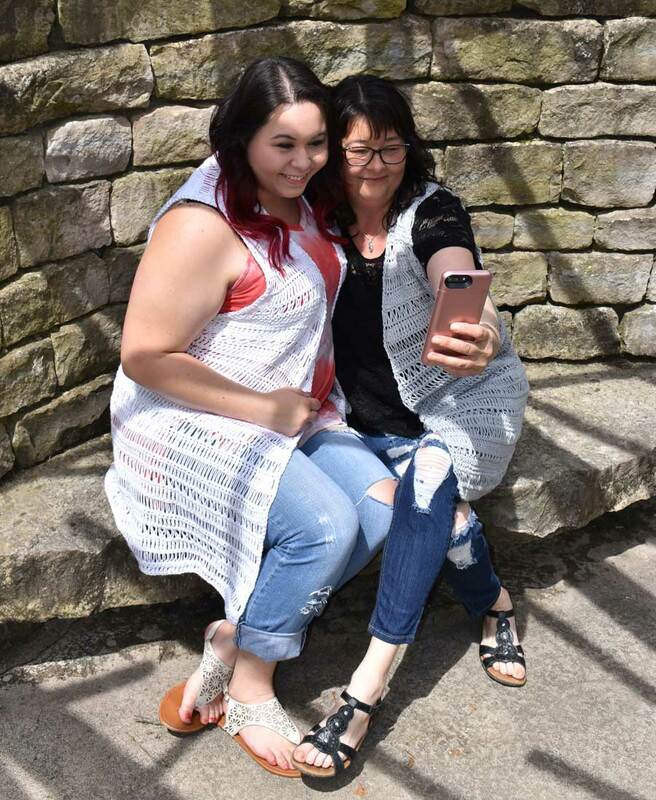 Now that you’re done, put that beauty on and take a selfie with you and your best friend rocking your latest handmade creation! 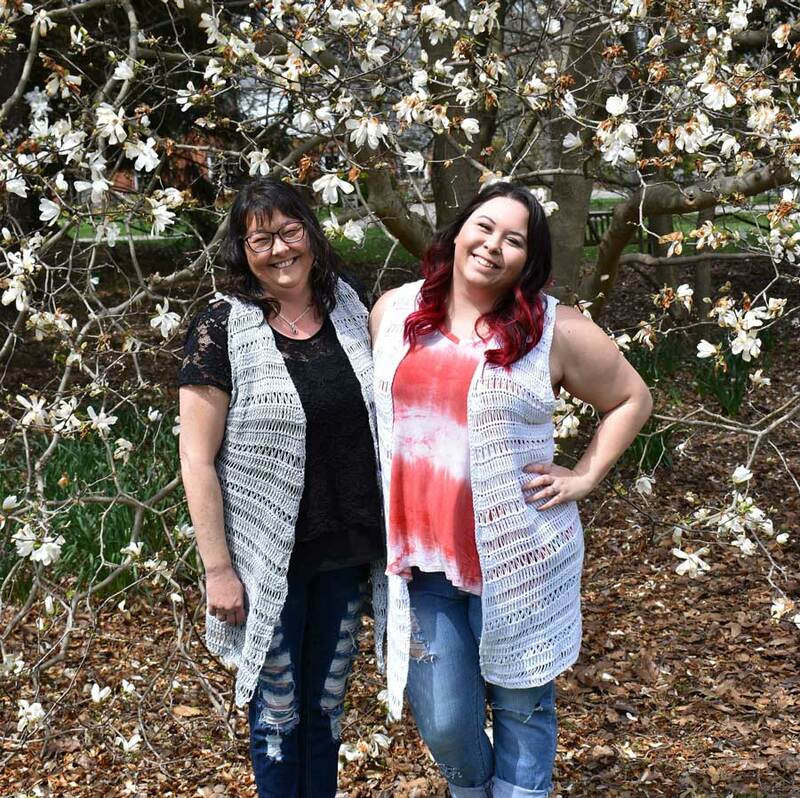 This cardi was created for moms and daughters, because as me and my mama showed y’all, you are never too old to match with your mom!! I hope to see many photos of you and your daughters, or you and your mom rocking your Best Friend Cardi’s!! Be sure to tag me on Instagram @sierrascrochetcrafts so I can see all your creations! I can’t wait to see what color you picked! Happy Mother’s Day to my mama, and of course to all you fantastic maker mamas out there! This Pattern is dedicated to my gorgeous mama, and best friend Tracy!